BRAINERD, Minn., March 12, 2019 /PRNewswire/ — Destiny Cruises LLC announced today that it sold its vessel and operation to Cragun’s Resort on Gull Lake. Cragun’s will begin offering day and evening cruises on Gull Lake in the spring of 2019. 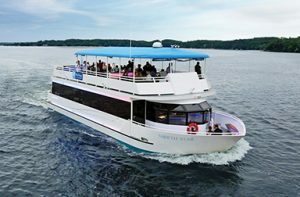 The 65-foot long double-deck vessel accommodates 120 passengers and will continue to offer open cruises, themed cruises and private chartered events to residents, tourists and guests visiting the Brainerd Lakes Area. “We launched Destiny Cruises in the summer of 2014, and we are happy to see a flourishing local resort maintain the business and vessel on Gull Lake. We want to thank the people of Brainerd, Nisswa and the local resorts and businesses who have welcomed and supported us,” said Liz Diedrich, Destiny Cruises partner and owner of Twin Cities-based research and marketing firm Diedrich RPM. “We are excited to be able to provide another amenity for visitors to the Brainerd Lakes Area on behalf of Cragun’s Resort. Now we can provide a new prestigious venue for weddings, rehearsal dinners, reunions or corporate events, and we are looking forward to offering day cruises to visitors to the area,” said Dutch Cragun, Owner. “Destiny Cruises was an established entity on Gull Lake, and we’re thrilled to continue this service for the community.” Cragun’s has decided to change the name of the operation to Gull Lake Cruises to more closely reflect their long-standing ties to the community and Gull Lake. Cragun’s plans on continuing to work with the other local resorts and hotels to offer this amenity for all visitors to the Brainerd Lakes Area. Gull Lake Cruises will be docked at Cragun’s Resort with easy access at the main Marina area. Gull Lake Cruises, which historically ran approximately 150 cruises per year, will continue to offer an option for your special events, such as when family and friends are in town and want to do something unique in the area, a vessel for your private parties, weddings, birthday celebrations, anniversaries, company outings, live concerts, Sunday brunches and so much more!. Cragun’s looks forward to expanding its ability to create memories that last a lifetime! To book cruises or for more information, please visit www.gulllakecruises.com or call 1-833-232-0317.